"We thought it would be interesting to get a view of the chemistry in an urban river throughout a snowstorm," said Kelsey Wood (B.S. '15, geology), a geology graduate student at UMD and a co-author of the study. "Salt concentrations during the snowstorm were surprisingly high—it was like we were analyzing sea water. But we weren't expecting such a high corresponding peak in metals." Previous research has shown that very salty water can force metals—especially copper, cadmium, manganese and zinc—out of streambed soils and into stream water. In the Paint Branch stream, Kaushal and his colleagues noted large spikes in copper, manganese and zinc immediately following the snowstorm. In a similar set of observations in Washington, D.C.'s Rock Creek, the team observed notable spikes in cadmium, copper and zinc following other snowstorms. These USGS stations collected data every 15 minutes on salinity, pH and nitrate ions—a harmful byproduct of agricultural fertilizers and other contaminants. These high-frequency measurements gave the research team valuable real-time insights, with several of the rivers showing a clear and nearly immediate connection between increased salinity and nitrate concentrations. More information: "Novel 'Chemical Cocktails' in Inland Waters are a Consequence of the Freshwater Salinization Syndrome," Sujay Kaushal, Gene Likens, Michael Pace, Shahan Haq, Kelsey Wood, Joseph Galella, Carol Morel, Thomas Doody, Barret Wessel, Pirkko Kortelainen, Antti Räike, Valerie Skinner, Ryan Utz, and Norbert Jaworski, was published December 3, 2018 in the journal Philosophical Transactions of the Royal Society B. "I continue to be surprised by the scope and magnitude of the recent degradation of Earth's surface waters." Really? Why surprised? This is 'selfish, self-centered, I'll do anything I damned well please' mankind we're talking about. He ruins everything he puts his hand to. I can assure you it will only get worse. Sorry to be a pessimist but this is mankind we're talking about. This is devolution at work. Just add this to the list of tipping points we're approaching. How did bottled water become so popular, anyway? When I was growing up, we would put a glass under the faucet and enjoy a cool glass of water. Not today. It's not devolution. Evolution has no purpose or goal, no direction. Chemistry and physics happen. What we call "life" has piggybacked onto those processes and just as an object in motion will remain in motion until acted upon by some force or another, "life" will continue to consume what it finds nutritious and will seek to build tunnels, nests, hives, dams, dens, create migration paths across oceans and continents using whatever appendages and behaviors evolutionary selection has equipped them with until some "force" checks those actions-- usually predation, parasitism, disease, or resource competition or depletion. We humans are just so clever at always discovering new ways to exploit the world around us we have no real competition other than ourselves, and no worse enemy. This article is misleading and assuming a lot. Many municipalities are switching to a beet juice deicer mixture to reduce the amount of salt used on roadways. Why isn't yours? The lead contamination crisis in Flint Michigan was created by negligent home owners. The source of the lead was the lead service pipe to the residence. All the municipal pipes had already been upgraded to iron. Service pipes are the responsibility of the property owner. The fertilizer runoff in suburban areas comes from the yard services used by upscale home owners. There are few farmers in suburban areas. And finally the plastic pollution that is now out of control can be traced back to the liberal hysteria over the use of plastic bags tap water . Liberals were convulsing over trees being cut down just to make shopping bags; which wasn't true to begin with. Waste trees and scraps were used for the low quality paper used to make bags. Trees are a renewable resource, oil is not a renewable resource. This article is misleading and assuming a lot. 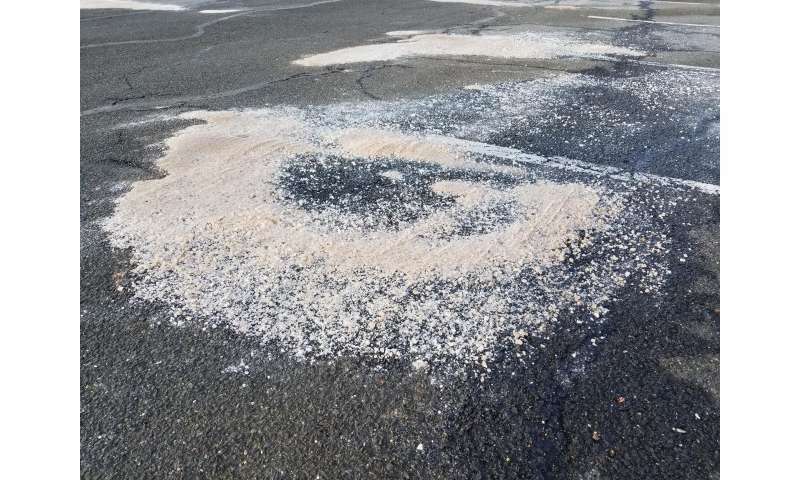 Many municipalities are switching to a beet juice deicer mixture to reduce the amount of salt used on roadways. Why isn't yours? The lead contamination crisis in Flint Michigan was created by negligent home owners. The source of the lead was the lead service pipe to the residence. All the municipal pipes had already been upgraded to iron. Service pipes are the responsibility of the property owner. The fertilizer runoff in suburban areas comes from the yard services used by upscale home owners. There are few farmers in suburban areas. And finally the plastic pollution that is now out of control can be traced back to the liberal hysteria over the use of plastic bags and tap water . Liberals were convulsing over trees being cut down just to make shopping bags; which wasn't true to begin with. Waste trees and scraps were used for the low quality paper used to make bags. Trees are a renewable resource, oil is not a renewable resource. Trees are a renewable resource, oil is not a renewable resource.